For the first time, here is a very fast weathering method for your railroad tracks using only six colors applied with your airbrush. With only five steps, you will get the result you were looking for without complications or complex painting processes. Once everything is painted, you only have to polish the tops of your rails (or mask them before painting) to remove paint from the part that makes contact with your locomotives’ wheels. The final look is a classic European or American standard track tone that can be seen almost everywhere. You can also paint more details with a brush using the same colours if you want an area to have more detail. These paints are non-toxic and odourless, so you can use them inside your home, in the area where you have your layout or railway model, even with children around you. 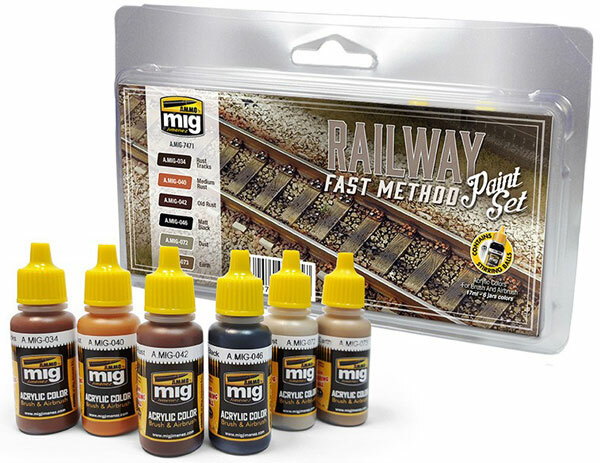 Copy this Railway Fast Method Paint Set to your MY ACCESSORIES roster.